People, bodies and back-types differ. So we created Therapod, the only seating system in the world offering fully adjustable back support. With this patented design, Therapod Basic Extra Highback supports every region of your back using body-specific strap adjustments. It’s no wonder health professionals, physiotherapists and chiropractors recommend it so highly. 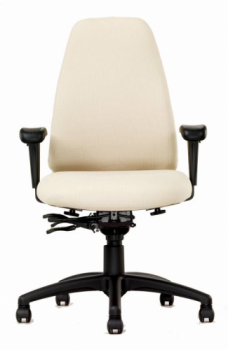 Patented adjustment 4-strap system, high density seat foam, 8-ply Canadian maple wood seat. Back height: 24" - 28"